Smartphones are making it easier and easier to get an experience similar to the one that you find on your laptop or desktop computer. A lot of this functionality is due to some of the incredibly useful apps that you will find in the various app stores but, in the case of the iPhone 5, there is also a lot of functionality available to you using just the apps included on your device when you first open it. One important feature is that the iPhone can handle PDF files by using the iBooks app on the device. This is a very helpful characteristic because, once you open the file in iBooks, it will continue to be available there. This will make it easier to find and open the file in the future should you need to read it again. iBooks is a great reading app, but it was not one of the first options I considered when determining how I wanted to read PDF attachments that I was receiving in my email messages. But the integration between the Mail app, PDF attachments and iBooks is so simple that it is really one of the best choices for reading those files. So you can follow the simple steps outlined below to start reading your PDF attachments using the iBooks app as well. Step 2: Open the message containing the PDF attachment that you want to view. Depending upon your mail settings and the size of the PDF, you may first have to download the PDF to your phone before you will be able to open it. Step 3: Press and hold your finger on the attachment until a menu opens from the bottom of the screen. 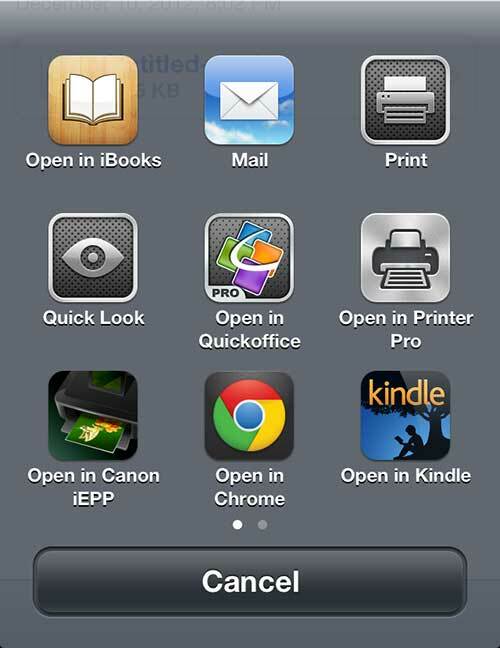 Step 4: Tap the Open in iBooks option. Note that, depending upon the other apps that you have installed on your device, you may have some additional options available to you in which to open the PDF. This will add the PDF to your iBooks library so that you can easily access it again in the future.